The moment y’all have been clamoring for is finally here, it’s the results of the 2012 Salmon League Baseball Amendments voting. We had ten amendments on the docket this year, but in the end it resulted in very few major changes to league play for this coming season. I’ve included a screen-shot of the actual voting so there is no question about the results and the anonymous responses everyone was allowed to leave for each question. Read at your leisure and let me know if you have any questions/comments/concerns/etc. Decision: League dues will be raised to $40 beginning in 2012. As always league dues should be paid in cash on draft day, preferably prior to the start of the draft. The bulk of the league voted for an increase in league dues, but an even larger margin of people voted to keep the total under $50. As such, I split the difference and increased the dues to $40. Decision: The league payout structure will change starting in 2012. The winner of the regular season will now receive a full payout of the original league due. 3rd Place = 10% of remaining pot, 2nd place = 30% of remaining pot, and 1st place = 60% of remaining pot. Decision: The move limit will remain at 45 for the 2012 season. Thanks to Levi for catching the error of my ways on this one. I totally screwed up the math b/c I dropped off the two votes for lowering it and took them out of the equation. The votes were 8-6 in favor of either keeping it the same or lowering it versus raising it or eliminating it. Decision: Divisions will be eliminated in 2012 and we’ll return to having one gigantic league. The divisional format proved to add very little to game play and only resulted in convoluted scheduling and horribly unbalanced schedules to accommodate divisional parity. 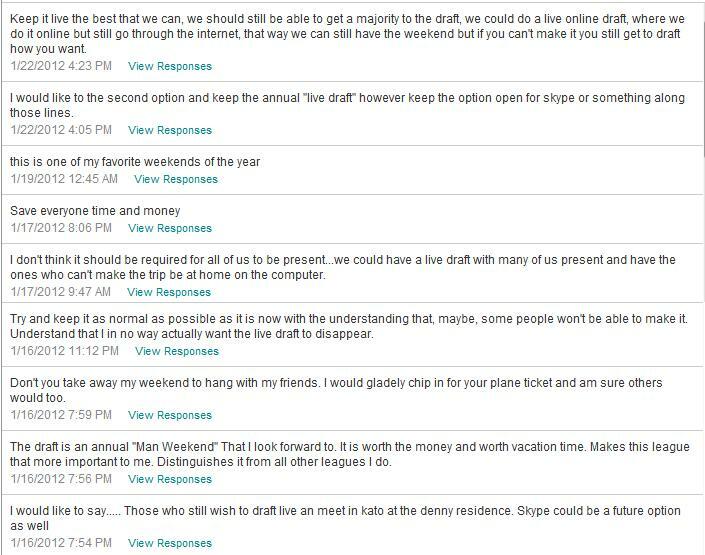 Decision: We will continue having the live draft for the foreseeable future and make concessions as necessary for those who cannot physically be at the draft due to work/family/expense/etc. Decision: Draft position will be announced on draft day for 2012. Obviously, this was a divided issue with half the league looking to keep the announcement on draft day and the other half looking to get it out of the way early. I definitely think it is something we can discuss for next offseason if there is still interest in a change—and I’ll try to have more of a concrete plan in place for how announcing them prior to the draft would work—but for now, we’ll say that a tie goes to the runner and stick with tradition. Decision: We will not be instituting a round-by-round draft recap. The owner of each team will be expected to keep up with who has and has not been drafted. There are currently no penalties for attempting to re-draft a player and there are no time limits in place. It is also not against any rule to politely ask that someone repeat who was drafted. If you’re having trouble keeping up it probably means that you either drank too much the night before, you’re drinking too much right now, and/or you’ve got 18 different lists and you look like a jackass. Decision: We will remain at three keepers (one pitcher, one position player, one flex) in 2012. 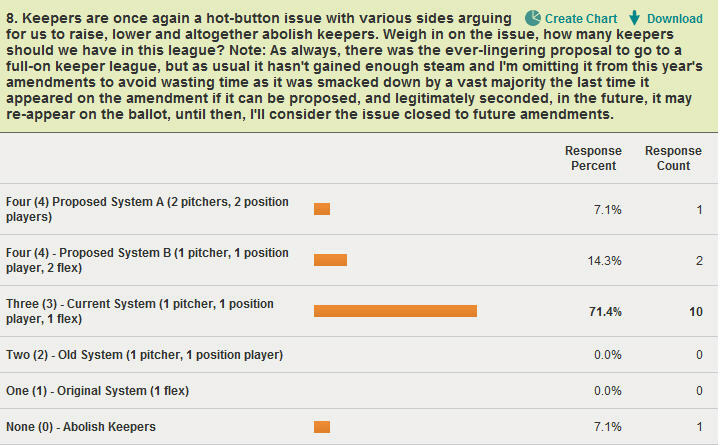 Given how little interest there was in making a change to the current system, I am going to give any keeper amendment the same treatment as I’m now giving the annual full-keeper league proposal, if it not seconded by another party, it will not make the ballot. Decision: We will be adding one additional bench spot to our rosters for 2012. Again, this was another vote that was tugged multiple ways. However, the majority of the league is in favor of increasing the overall number of bench spots. Much like the league dues voting, I am going to split the difference and roll with four bench spots as a majority of the league also does not want 5 bench spots. Decision: We will not be switching to a weekly roster change format, but rather staying on the daily roster change format that we’ve employed since the inception of the league. Everyone in the league is allowed to openly mock Mike for suggesting this amendment. Do not let him try to baffle you with his “context” and rationale explanation for suggesting it.